Iperf is an open-source tool. This has the awesome benefit that it’s available on lots of different operating systems and even CPU architectures. That means you can use your ARM based smartphone/tablet to connect to your Linux Intel based server or to a common windows PC. All combinations are possible making it a very versatile tool. Ubiquiti access-points even have a version built-in! 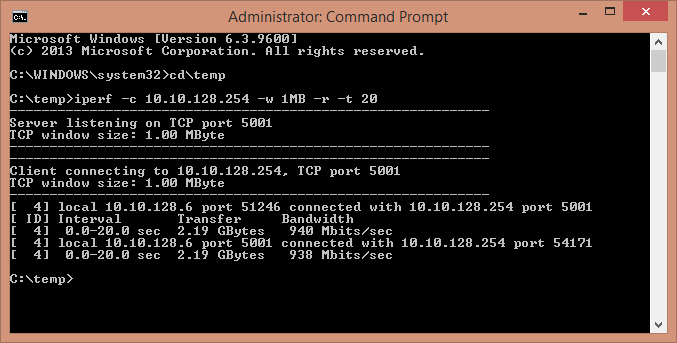 Iperf consists of one executable which can run in both “client” or “server” mode. Both allow options to be specified to direct what you wish to have tested. The server part is most often the easiest because most differentiating settings are done on the client. Every scenario you wish to test requires a different set of options, so it all depends on what you wish to achieve. I will also try and comment about the amount of speed that you ‘should’ be reaching in a given situation. Testing something is only ever useful if you know what you are testing and understand and are able to interpret the results you are getting and what you should be achieving. On a Debian/Ubuntu based operating system it’s quite easy to install iperf, you simple perform a “sudo apt-get install iperf” and it should be automatically installed! The tool itself is about 250KB. As with the Debian based linux distributions you can install it using the operating system’s included software tools. For a Red Hat based systems it seems you need to add a repo using “yum –enablerepo=epel -y” and then you can use “yum install iperf”. For windows, it’s a little bit harder to install iperf since windows does not have a centralized open-source software install system. The easiest way to download it is by using a pre-compiled version. I most often use the version which is available from http://www.iperf.fr. To directly download the current Windows version, click here. For android it’s a little bit harder to get a good working version of iperf. There are several versions available from the market and in the past I have also been able to find a pre-compiled version online which I managed to get working. Next to the above version I use “Aruba Utilities” which as an iperf based test built in. To my knowledge this is the best working version of iperf currently available on Android. There are some CLI versions available but they don’t work completely correct. -w TCP Window size, most often the default is 64KB which is a bit small to test actual bandwith, especially on high bandwith connections. I have found 1MB to be a good size to try and saturate links. Sometimes a link cannot be fully utilized by only using a single connection. Also firewalls, NAT or some other techniques can have different results with 1 stream or multiple streams. Often using multiple streams puts more pressure on the devices within the 2 computers and gets you a higher result. If you wish to really stress your link or NIC you can try to do a simultaneous upload and download test. This will reveal weak spots and give you an idea of how upload and download together will affect your speeds. This will even get most ‘desktop’ Gigabit NIC’s on it knees because they just aren’t fast enough to handle it. The above should give you most options you would use under normal circumstances. There are several more, like switching between TCP or UDP, but you can find those by checking the help of the application itself. Mbit and Mbps mean the same. Mega (Capital M) bits per second. 1 byte is 8 bits. So let’s say we have an internet connection of 1Mbit that would mean you could achieve 1024Kbit or 1Mbit, 128KB/sec or 0,125MB/sec. Captical M means mega, small m means micro. Be correct! “bps” stands for bits per second. So 100Mbps stands for 100 Megabit and 100MBps stands for 100 MegaBytes per second. A big difference! Most often Mbps is used for bits and to describe Bytes you use MB/sec. Now a connection will never give you 100% of the line or wire speed. There is always overhead because of TCP and other protocols. But at all times around 92,5% should be achievable. If we take a Gigabit Ethernet line as an example this is 1000Mbit/1000Mbps, 125MB/sec. 1Gigabit or 1000Mbit will give you a max net result of around 945Mbit at maximum, but it should always deliver around 900Mbit. 900Mbit translates into 112,5MB/sec. 100Mbit will deliver you around 11,25MB/sec and 10Mbit around 1,125MB/sec. This is all calculates quite easily. With Fedora 20 at least, it's just a matter of doing 'yum install iperf' without any special repository actions otherwise. It's in the default repo.